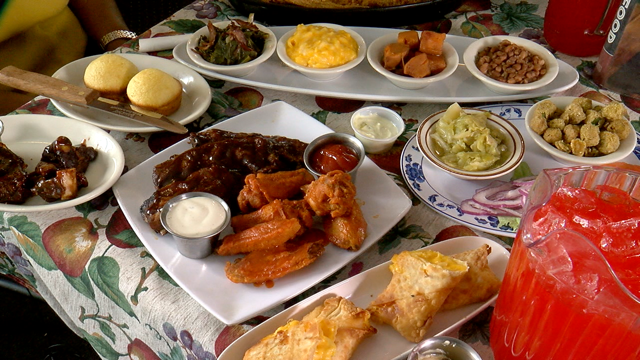 For years, several restaurants in the Denver area have been serving up a cuisine full of history and heart called soul food. DENVER — For years, several restaurants in the Denver area have been serving up a cuisine full of history and heart called soul food. Cora Faye’s in Aurora has been in the soul food business for 12 years, using recipes from owner Priscilla Smith and her mother, Cora Faye. “The recipes we use are a lot of my family recipes passed down by word of mouth,” Smith said. But as our Colorado continues to grow, and different palates enter the food scene, some new food trends have emerged using soul food as inspiration. “Denver’s in an interesting place for its soul food scene because a lot of the traditional black neighborhoods are gentrifying, in particular, Five Points, so in the last several years some great places have closed,” said food writer Adrian Miller, also known as “The Soul Food Scholar." But Miller said new restaurants are opening up in neighborhoods across the Denver metro area, putting new spins on classic dishes. “The hottest trend right now is vegan and that’s where a lot of the creativity is in soul food. So it’s taking out the traditional use of pork to season vegetables,” Miller said. “Cooks have to find ways, they have to find spices to compensate for the loss of that seasoning,” he said. According to Miller, the next trend is "downhome healthy." “One of the interesting trends in soul food right now is the effort to make soul food healthy…taking out the lard, the salt, and sugar and finding substitutes,” Miller said. “That’s using more extravagant ingredients. So maybe you would use duck fat or put saffron in or use heirloom vegetables,” Miller said. And the fourth food trend is "fusion." “We see a lot of fusion now so there’s a lot of fusing soul food with other cuisine…as different cultures come in contact with each other and try to come up with something new,” Miller said. But Miller said, while new-age soul food is tasty, it’s also important to look at soul food’s beginnings which can be traced back to the deep South. “It’s not just the master’s throwaway food, it’s not just slave food…the main wrap that soul food gets is that it started out in slavery as slave food which I think is really not the true story of soul food because it’s much more complex,” Miller said. According to Miller, soul food pulls inspiration from three continents: The Americas, West Africa and Western Europe. Miller said now, the cuisine can be enjoyed anywhere because the essence of soul food at its core is the comforting taste of home.